It must have been special to see this gifted athlete and footballing genius play in the days before the city folk and the nation noticed him. Some say those were his best years – witnessed by lucky punters on local paddocks – mostly at Cootamundra. 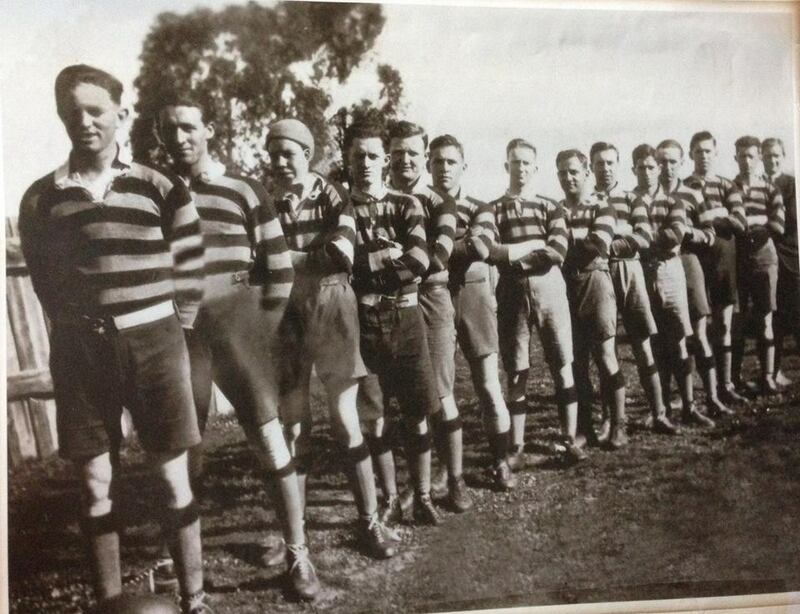 Cootamundra Cadets team of 1921 which included Eric Weissel; from left to right from back row: Sid Drinnan, T.Maher, C.Kelly, Tom Ryan, L.Deal, Glenn Evans (referee), T.McGuigan, Eric Weissel (aged 18), L.Ryan, J.Sissian, S.Whealy (secretary & treasurer), F.Smith (captain), J.Maffersoni (president), R.Cohen, Perce Mills, S.O’Neill, K.Cohen (mascot), Sid Chambers, M.Rooney. Source: S.G. Chambers, Cootamundra. On 30 August 1922 the tooting engines came up from Tumut. The special train brought 200 people. The Cootamundra Club met their visitors at the station at 3:20 and “motored them to the ground at Quinn and Renehan’s estate”. Sidelight: John Quinn was the pre-eminent developer of the Kelpie. He had a stock and station agency with J.T.Renehan. A proper football field at Fisher Park was still two years away. Over 2000 people gathered on the ground. A ground without a fence. They paid £58/18/. Some bought three-penny cards “with the names of the teams thereon”. For the first time Cootamundra Rugby league Club were hosting a challenge for the Maher Cup. Coota won, 20-5. Afterwards the visitors were invited to a dinner at Carberry’s Australian Hotel, and given a right royal send off back home to the hills. Cootamundra then thwarted 17 more challengers, 17 more teams, until Temora tooted away with it in June 1924. But Coota went north and got the Cup back again the next week. From 1923 to 1926, with Eric Weissel and his friends, they won 38 challenges and lost 4. But let us wind it back. It had not always been roses. Coota’s first challenge for the Maher Cup was on Wednesday, 21 June 1922 at Gundagai They lost 12-5. They lost again, badly, on Wednesday, 12 July 1922 again at Gundagai 30-2. The following week Mr. Phil Regan of Glebe arrived in Cootamundra to captain and to coach – to develop a team of champions. He duly fulfilled his duties. Five weeks later Regan unveiled a new-look team, drawn largely from Cootamundra Juniors. They won the Maher Cup. It included 19 year old “Ec” Weissel. Ec was the youngest child of a railway fettler from Brawlin, one of eleven. At his birth in February 1903 his eldest sister was already aged 20 and five other Weissels were in their teens. Father, Edward had been captain of the Brawlin cricket team. All his brothers, Ted (Jr) or E.P, Jack, Bill, Cecil and George were competitive sportsmen. Most of his sisters likewise. Aged 14, in 1917, he won the 15 years boys sprint at the Railways Employees Picnic at Wagga, attended by 3,000 people. No-one would have been surprised. During the Great War football matches were held from time to time, but the mood was against unproductive leisure and more so against the reporting of such frivolities . At the Star Hotel in March 1919, just as the deadly Spanish Flu epidemic was about the take hold and soldier’s receptions were the order of the day, the Cootamundra Rugby Club, in its royal blue and white colours, was re-formed. Sport was being organised all over town. By May there were the Bing Boys, the Waratahs and Railway teams, as well as Cadets, Juniors and Seniors – playing League or Union, or both. 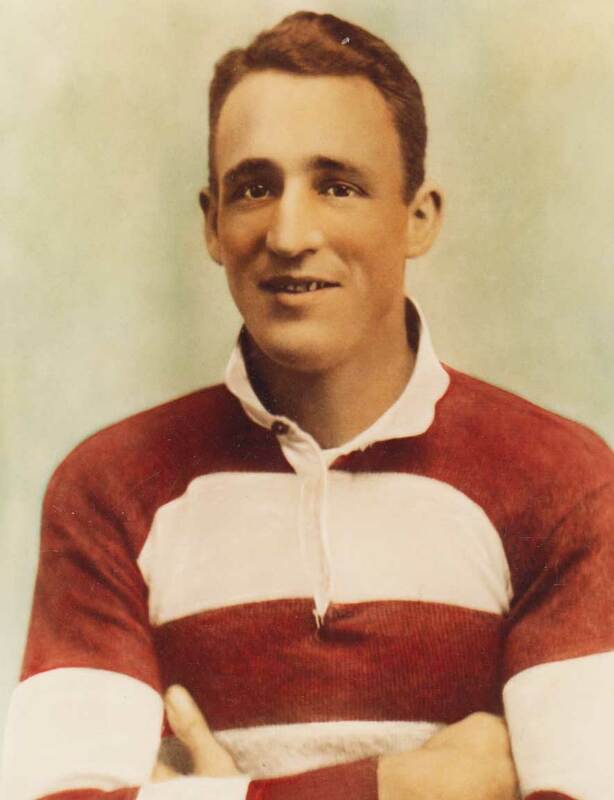 On 7 June 1919, under Union rules, the fast young Eric Weissel played on the wing for the Bing Boys against the Waratahs, in a curtain raiser to Cootamundra Seniors versus Manly. The Bing Boys lost, the Seniors won. In 1920 Eric blossomed as the young star of the Cootamundra Cadets team. They defeated the other local Coota teams in the E.C. (Ted) Mangan Cup. The red and blues beat Harden 12-0 with Eric scoring three tries and setting up the fourth. He scored against Gundagai, again under Union rules. By August 1921 he was playing centre and being lauded for his long goal kicks. Cootamundra first challenged for the Maher Cup in 1922, twice, against Gundagai. The selectors didn’t pick 19 year old Eric Weissel. They lost, twice. At the third challenge on 23 August 1922, Tumut were the Cup holders. As the Maher Cup originated in that verdant valley, surrounded by the Snowy foothills, no team coveted it more than the Tumut Blues. Coota’s new coach from the city, Phil Regan had settled in. He picked a “…team constituted principally of juniors with whom he had displaced seven or eight of the old stale players in first-grade”. They “made a brilliant showing”. Weissel scored three tries. He was called Cootamundra’s Beauford, after the famous race horse. 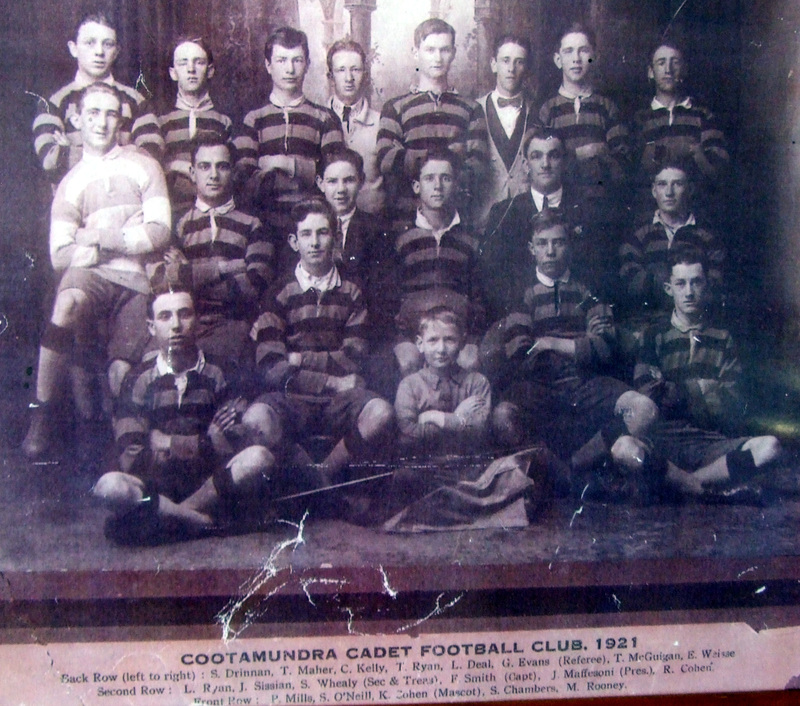 Posted by Carmel O’Rourke on Cootamundra Remembers this team from 1922 is: T.McDevitt, Eric Weissel, S. Chambers, M. Rooney, Brian O’Connor, Tom Doran, Tom Ryan, J. Sissian, G. Mills, R. Young, J. Thomas, T. McGuigan, W. Kelly and J. Deal. Brother Jack Weissel is in the suit. But the love affair between Cootamundra and Eric Weissel may have been short-lived. In the 1920s the district had a strong dairy industry. The Berrima District Company processed the dairy products for the farmers’ cooperative. Young Eric had worked in their offices for four years. Berrima wanted to promote him. They wanted to relocate him to Burwood, in Sydney. After just five Maher Cup victories and at only 20 years of age, Eric had made such an impact as a tennis player, cricketer and footballer that a civic farewell was organised for his departure. On 13 February 1923 in the Parish Hall the Glee Club organised the proceedings. In the speeches reference was made to him becoming a Davis Cup tennis player, rather than a Rugby League Kangaroo. Lucky for Cootamundra, he must have got lonely. He was back in town within weeks, back to playing cricket with his mates. On 5 May he was on a losing side but bowled seven wickets for 28 runs. Weissel was the outstanding player on the ground; his three tries were all brilliant and showed him at his best. It would be hard to find a player as fresh, resourceful,cool, and “clean” as Ec, or one enjoying more popularity with local football enthusiasts. Yesterday he dummied, side-stepped, out paced, and generally out-manouvred the whole of the opposition. Of the 19 points scored, his contribution was 13 — three tries and two goals. He was selected for Combined County who defeated Newcastle. In 1925 he captained the Southern Districts in a victory against New Zealand, kicking the decisive points from just inside half-way. And if life wasn’t busy enough he decided to coach the Bethungra team in 1926. The reward was some victories and a broken nose. But his sore nose felt better when Coota regained the Cup from Temora. It was reported that a hundred women flocked to hug and kiss him. Whatever the season Ec was always immersed in sport. In November 1926 he went to Sydney to represent Riverina in Country Week cricket. He scored a double century, including 28 runs in a single over, and bowled 6/47. An 18 year old Donald Bradman – Cootamundra born, but Bowral bred – was playing for the Southern team. Weissel caught and bowled him. In local competitions he habitually retired not out. In 1927, aged 24, he may have been contemplating marriage and family. John Meagher & Co emporium owners at Temora offered him the position of second-in-charge of the grocery department, at 10/- per week more than his current job, plus £100 per annum to play for and coach the team. [There are other reports which state that he joined James Thom’s store.] To Coota’s surprise their hero didn’t refuse. He went to live 32 miles up the road. Temora, full of local amateurs except for their new captain-coach, steamed into Cootamundra on 13 July 1927 for a long awaited challenge. They drew a record Cootamundra Maher Cup crowd. Eric received applause from the Coota folk. Temora failed, against a side now well reinforced with paid imports. Temora did not have a chance to challenge again until 3 July 1929, when they duly defeated Cootamundra, whose halcyon days were then over. On that day Weissel, was on representative duty. He did not play, but he had well-prepared the Temora wheat lumpers. A good deal of interest was taken in the Australian Rules football match played at Temora on Wednesday as a benefit for the Temora Hospital, when Bectric, premiers of the Temora District Competition, defeated Wattle Park by 77 points to 75 points. Eric Weissel, the well known Rugby League five-eighth, proved himself to be a good all-rounder. He scored 24 of the total points for Wattle Park. On Sunday playing Soccer, Weissel scored three of Temora ‘s five goals against Coolamon. At the end of the 1927 season he was honoured by the Temora club. In March 1928 he married Miss Eileen Cashman of Cootamundra. The Cashmans had a refreshment room in Parker Street. Eileen was a fine hockey player in an era when hockey was important. In 14 July 1928, in Sydney, Eric Weissel made “a glorious debut” for Australia at the Sydney Cricket Ground before 44,548 spectators. In 1929-30 he was the hero of the Kangaroos tour to England. In 1930, aged just 27, Temora paid homage by putting the magnificent Weissel Gold Cup into play. It is still being played for. This entry was posted in People and tagged Cootamundra, Eric Weissel, Temora. Bookmark the permalink.